If you are looking to savour authentic Philippine Islands and Chinese food, then the best place you should head towards in Dubai is Rocky’s Café at Regent Palace Hotel. This cafe is the biggest Filipino nightspot and eating place in the town that is tucked into the mezzanine floor of Regent Palace Hotel. Rocky’s café is not only famous because of its delicious food but it is also known for its Dj and Filipino band, which play live music at this venue till early morning. In addition to this, special laughter shows and karaoke nights also takes place in this cafe which drags lot of guests from different areas of Dubai. Visitors can also enjoy food and various alcoholic drinks along with the live performances. 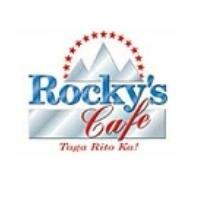 - Visitors have dine-in option for lunch and dinner at Rocky’s Café. - Rocky’s Café serves the food of Philippine Islands, which usually allures people belong to that region or those who love to try new cuisines. - Guests are allowed to smoke at Rocky’s Café. - Apart from scrumptious food, alcoholic beverages are served at this venue. - Karaoke nights and special laughter shows are the specialties of this cafe. Rocky’s Café opens on all days of the week and its usual operating hours are from noon till 3:00 am in the morning. Regent Palace Hotel, World Trade Center Road - United Arab Emirates. Union Metro Station 1 is 600 metres away from the Rocky’s Café at Regent Palace Hotel in Bur Dubai. On foot, a commuter can bridge this gap in about 7 minutes if he or she heads southwest on Omar Bin Al Khattab Road/D 88 towards Al Maktoum Road/D 89, then turn right onto Al Maktoum Road/D 89 and afterwards turn left onto 17th Street to locate the destination on the left. Directions from Union Metro Station 1 to Rocky’s Café. Dubai Municipality Headquarter – Dubai bus stop is 110 metres away from Rocky’s Café. This distance can be covered on foot in about 1 minute. If a person heads northwest on Baniyas Road/D 85 towards 17th Street, then turn right onto 17th Street and soon he/she will find the destination on the right side. Bus numbers 53, C7 and C9 have stops at this bus station. 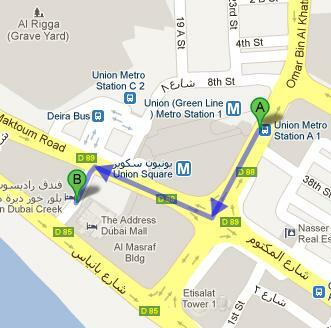 Directions from Dubai Municipality Headquarter – Dubai to Rocky’s Café.